In late summer, I started looking for a replacement for my Marshall Bergman Theo messenger bag. My black leather Theo had served me well for close to four years, and I would recommend it strongly to anyone looking for a solid messenger bag, but my daily usage had starten to take its toll. Also, I had purchased it when I still had a 15” MacBook Pro. It was a bit overdimensioned for my current needs. 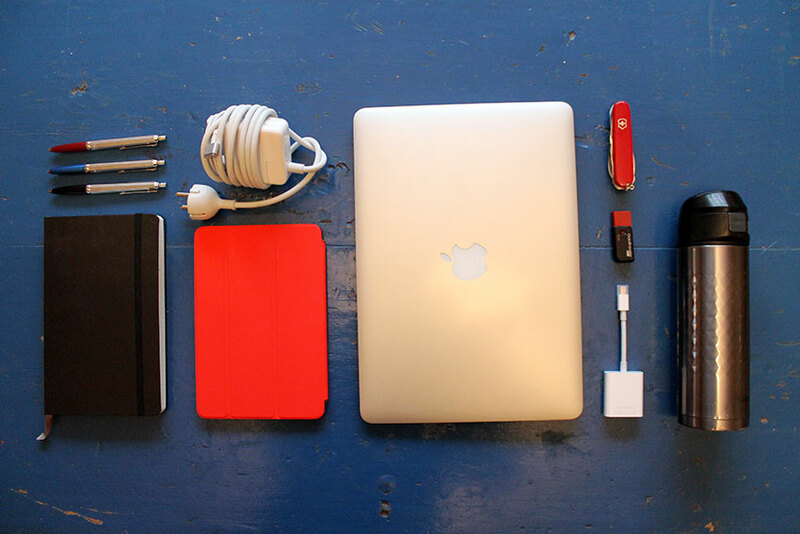 MacBook Air (13-inch). This is the mid-2012 model outfitted with a 256GB SSD, 8GB of RAM, and a Core i7 CPU. I bought it as a replacement for my 15” MacBook Pro the summer before I started studying. It isn’t the beast of a machine my MBP was, but the combination of portability and battery life is hard to beat. It is starting to show it’s age, though. Magsafe 2 45W power cable. I could get by without it most days, but I subscribe to the notion of safe rather than sorry when it comes to battery life. Also, I love my maxed-out screen brightness. iPad mini Retina with a red smart cover. For reading, mostly. Zojirushi 43cl tuff mug. Never leave home without it. Moleskine classic notebook, squared, hard cover. For random thoughts and layout scribblings. Ballograf Epoca Chrome. I don’t care much for writing by hand, but when I can’t avoid it, these are my go-to pencils. Ballograf is the last pen and pencil manufacturer owned and operated in Sweden, and I’ve used their Epoca pencils since I was a kid. Ray Ban Wayfarers with a case, in the summer. Victorinox Classic army knife. The cork screw is probably the tool I use the most, but it’s a good tool to have around just in case. Cinema Display to VGA adapter. USB stick. Because it’s still 2008, apparently. I occasionally bring along a textbook or two, but most days, this is what I keep with me. It’s a pretty light load. With that in mind, I was looking for something slim and lightweight that still wouldn’t limit me too much in what I can bring with me. I use my bag pretty much daily, all year round, so I also needed something sturdy that keeps my stuff safe in all weathers and seasons. I first heard of Ernest Alexander four years ago, the last time I was looking for a new bag. I was scouring the web for high-quality messenger bags when I found this thread on StyleForum.net discussing the then newly established brand. It seemed like the users had nothing but good things to say: ”great quality”, ”good support”, ”well designed”. About the only thing that didn’t sound good to me was the price. I couldn’t justify spending that amount of money on a bag at the time, so I settled for the more affordable Theo instead. When the time came to replace the Theo, Ernest Alexander was the first brand I looked at. 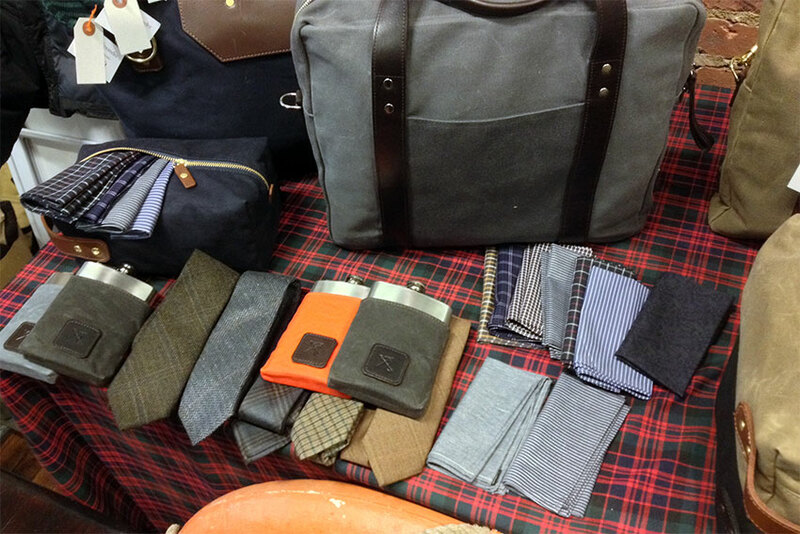 Some of Ernest Alexanders many products, including a charcoal grey Watson briefcase. Since 2010, Ernest Alexander has expanded their selection with plenty of products, including a number of new messenger bags and briefcases. I spent a lot of time comparing their products and analyzing my needs before I settled on one. 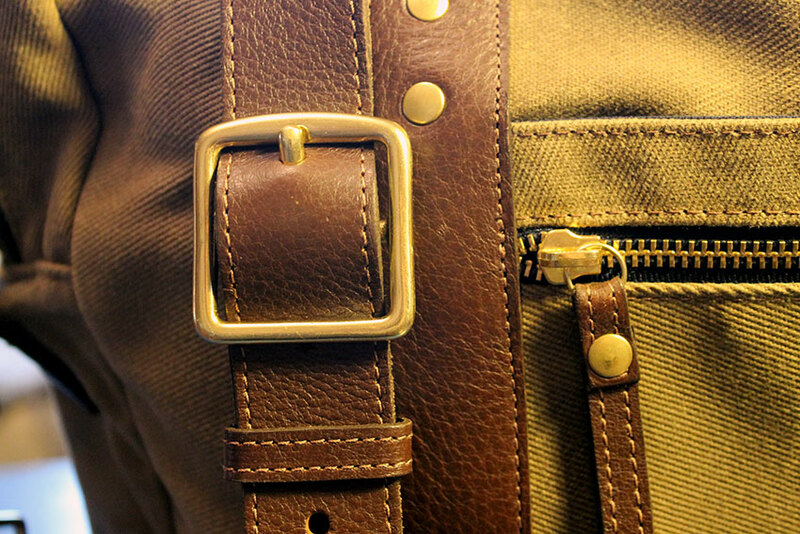 In late August, my Watson briefcase in tanned waxed cotton, brown leather and brass arrived. The Watson has leather handles and a detachable shoulder strap, so it can be carried both as a messenger bag and as a briefcase. 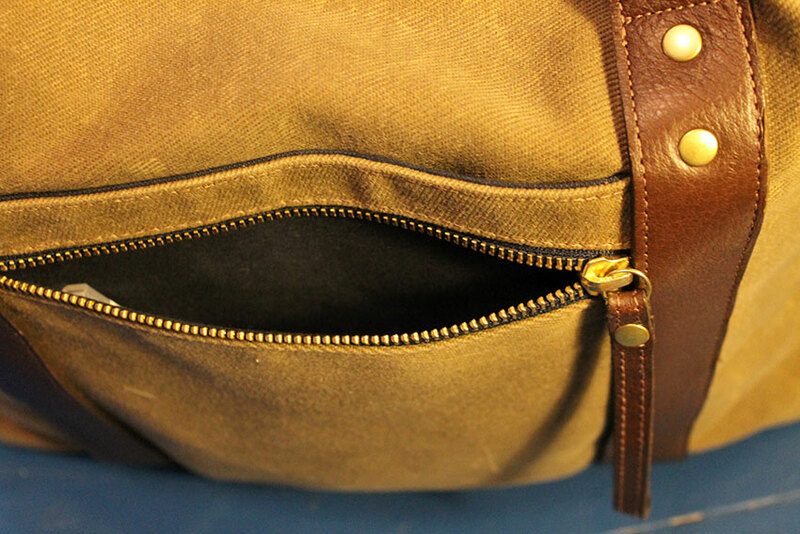 There’s exterior slip pockets on both sides and a small zip pocket on the front. The insides are covered in navy felt. There’s a 13” laptop compartment secured with a button on one side, and on the other, there’s one large and one small compartment and three pen holders. You’ll find a video of Ernest Alexander presenting the bag below. Note that the design of the interior has been changed since the video was shot. The first thing that struck me when I took the bag out of its wrapping was the quality of the materials and the level of workmanship evident in their construction. 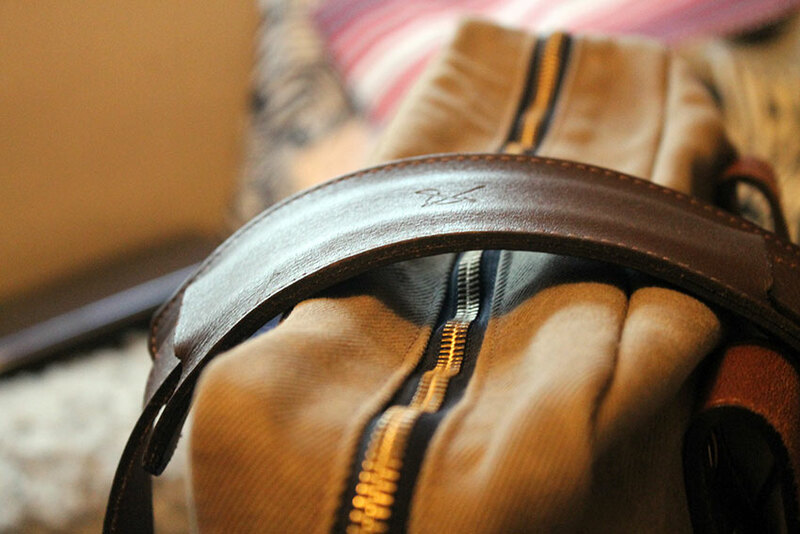 Everything from the cotton to the leather and the brass feels incredibly sturdy and solid. I’m a sucker for quality leather, and I absolutely adore the leather on the Watson. It’s soft, thick and buttery. Three months worth of wear and tear is too little for me to comment on the long-term durability of the bag, but I wouldn’t be surprised if it’ll last me for a long time. Comments from other Ernest Alexander customers mirror that sentiment – many of them have had the same bag for four-five years. 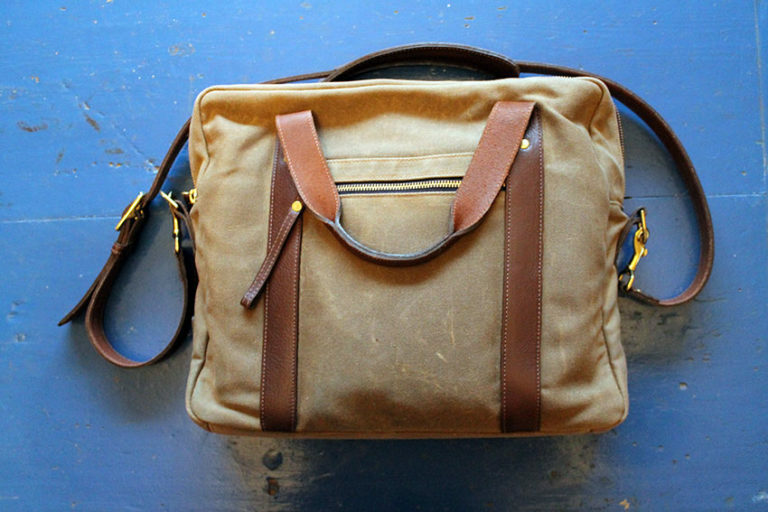 The founder of the company, Ernest Alexander himself, still uses the same Hudson messenger as when he started the brand in 2008. The Watson is constructed out of wax cotton. The color of wax cotton changes as the material ages and absorbs dirt and color from other fabrics. Ernest Alexander are very up front about this, and the change in color was obvious within days of when I received the bag. 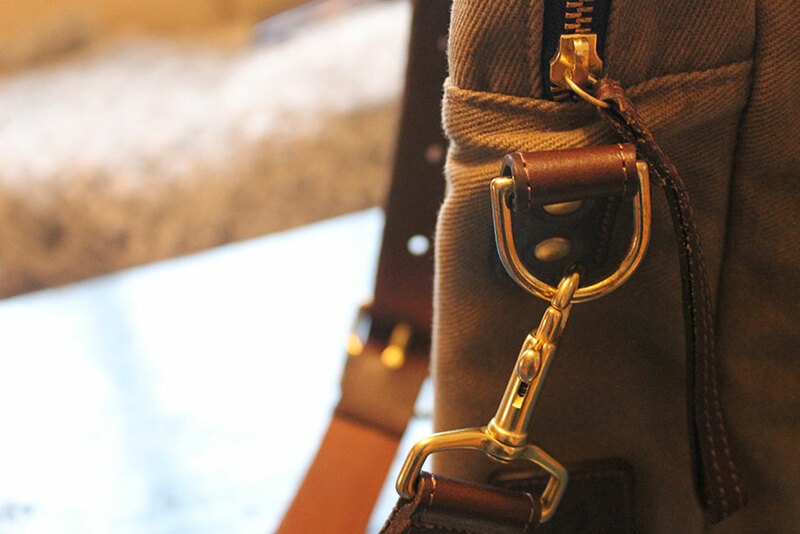 Three months later, the shade of the tanned cotton has become noticeable darker – especially on the back of the bag, where it comes in frequent contact with my jacket and pants. It’s clearly visible in the second photograph in the gallery above. If you want the bag to retain the exact color it had when you received it, I can see how this might be an issue – especially if you enjoy your blue denim jeans. 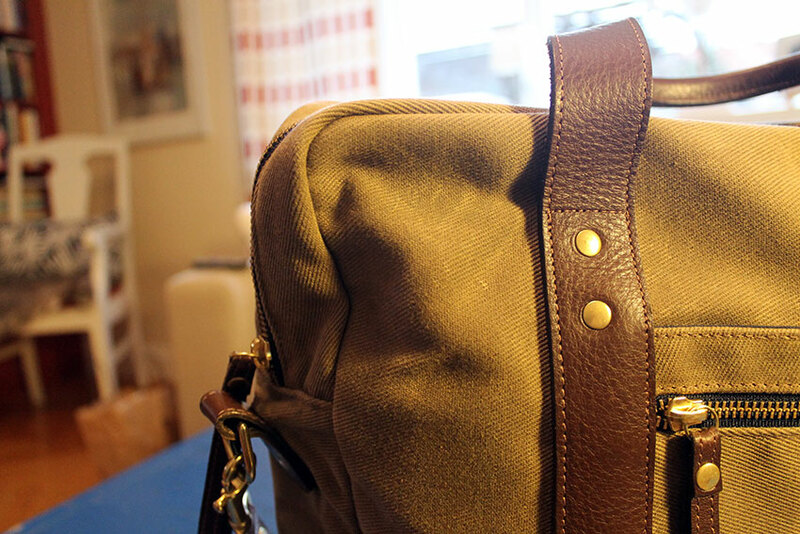 But I prefer the darker and slightly worn look the bag is developing. The Ernest Alexander Watson is a looker, no doubt about that – I have probably gotten more compliments for it than any other products I’ve ever owned. But it’s more than just easy on the eyes. I was a bit worried when I ordered it that it would be too small for my needs, but it has proven to be just right. The laptop compartment is perfectly sized for my 13” MacBook Air, and the slightly larger of the two compartments on the other side fit my Moleskine notebook and/or my iPad Mini. 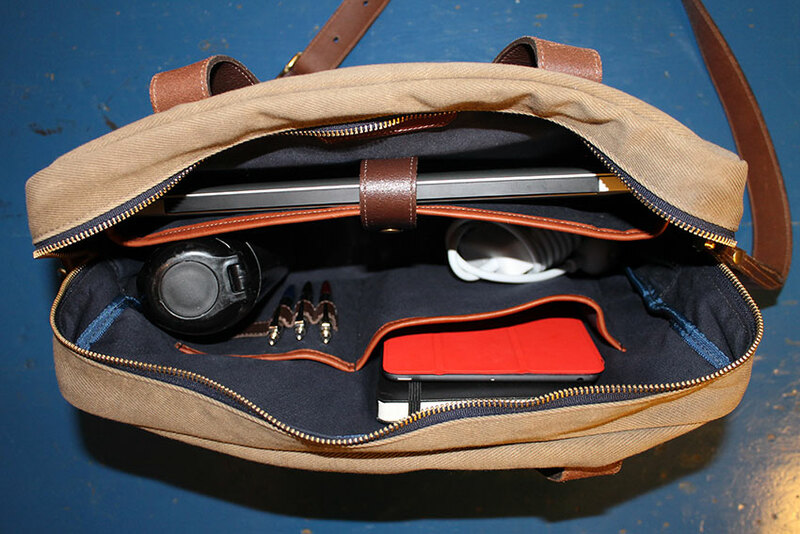 The large center compartment is big enough for my power cables, the Zojirushi tuff mugg and one or two textbooks. I haven’t gotten much use of the outside slip pockets, mostly due to the constant threat of rain this fall, but the outer zip pocket is great for the small stuff that I want easily accessible: pocket knife, cables, and so on. The quality comes with a price, of course. 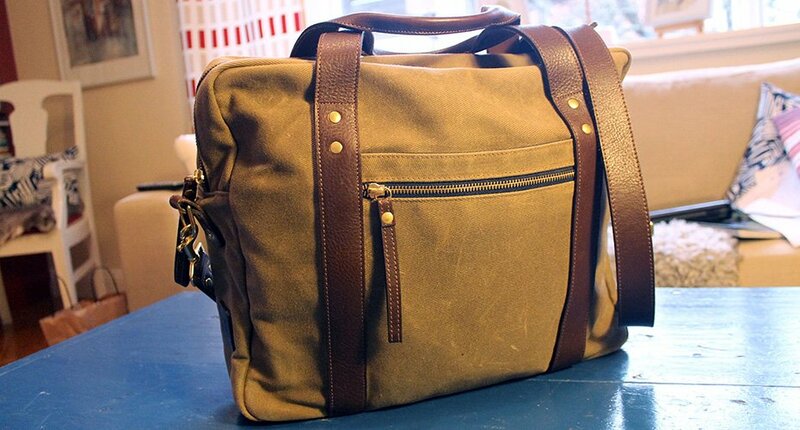 The Ernest Alexander Watson brief costs a cool 370 USD, so it’s not exactly one of the cheaper bags out there. I managed to save another 50 USD by using the rebate code I got for signing up for the newsletter, but 320 USD is still a significant amount of money. Is it worth it? Most people that I’ve spoken with seem to think that no bag is worth that amount of money. I disagree. The days that I don’t use a messenger/briefcase are few and far between, and when I do use a bag, I need to be able to rely on it. I fully intend to use the Ernest Alexander for at least three to five years, and judging from my early impressions and reviews from other customers, I’ll be able to. What’s 320 USD divided by 1 000 days? In my eyes, it’s a pretty damn good value. Of course, cost divided by time is a very pragmatic (almost cynical) way of measuring a products value. Chris Bowler recently made a strong argument for the sentimental way in an article on Tools & Toys: ”Quality items not only endure, but they also endear.” Call me materialistic, but like Chris Bowler, I love quality products: products made with love, care and pride. 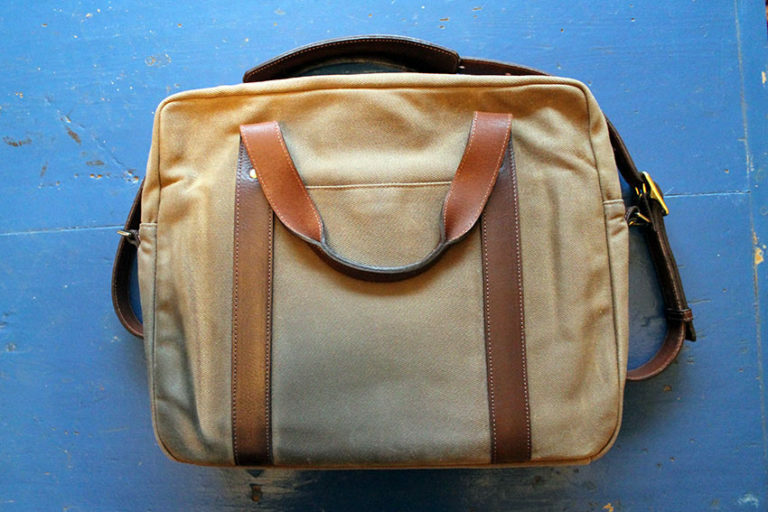 I can sense that care and pride of workmanship every time I pick up my Ernest Alexander Watson briefcase. If you can afford it, it’s a great purchase. ←Is It Too Late to Drink Coffee?